In February 2013, O’Herlihy Access Consultancy (OHAC) was engaged by a large Irish hospital in Dublin to carry out a high level accessibility review of the existing signage and the wayfinding system in place at the hospital. The review identified the legislative responsibilities of a healthcare facility in relation to accessibility and wayfinding; the impact of poor wayfinding and inadeaquate signage in healthcare environments; the benefits of providing a good wayfinding system and the latest national and international best practice guidelines available to assist in the provision of a good wayfinding system. OHAC advised the hospital on the importance of incorporating accessibility when developing their wayfinding strategy and in the procurement of new signage and provided the hospital with a number of national and international case studies highlighting various approaches taken by other healthcare facilities when developing their wayfinding strategies. 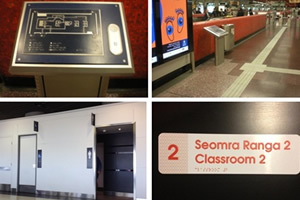 One of the observations from the study is that a good wayfinding and signage system will improve accessibility for all people and not just people with disabilities. For example, the first time visitor will benefit from easy to use access sign and a parent with two kids attending the out patients department will benefit from good accessibility. Finally, as part of the review OHAC made a number of key recommendations on how the hospital could improve their overall wayfinding strategy ranging from the provision of pre-visitor information on their website to the appointment of someone with responsibility for accessibility within the hospital. This project was carried out between February 2013 and March 2013.